It's always hard to get back into a routine after being away for a week, but I have to admit, this week was kinda too good to be true! Not only did the week kick off with some fabulous events, like the Coca-Cola Taste the Feeling party, and Fancy Pufs' 1st Birthday, but the long weekend brought with it Valentine's Day and Family Day. On Sunday we took a drive to my family's place in Vineland, stopped into Dillion's Distillery for some gin tasting, and had a casual night making dinner, sipping wine and snacking on cupcakes and cookies from Kelly's. We drove back on Monday and spent the day with family, and ended the night watching some of the Grammy's. Since Monday finally graced us with some somewhat bearable weather (anything seems bearable when it's not -30 degrees) I left the parka at home for our outing. Black and white is always so fresh and effortless; a crisp turtleneck and pointy toe bootie really create a minimalistic vibe but in a bold way. My marble bag has been pushed aside as of late but it definitely felt fitting to bring it out with this sophisticated colour combo, and matching marble studs. I'm thinking this bag is going to make a resurgence in my wardrobe in the weeks to come. Can we also just take a moment to praise the pink wall? I may have had to walk a few steps off the beaten path to get close to it… but, so good, right? Are you feeling the black and white? Or have you been embracing colour in hopes for an early spring? You look absolutely lovely as usual, and I agree - that marble bag needs to come out more! Great pink wall score as well! 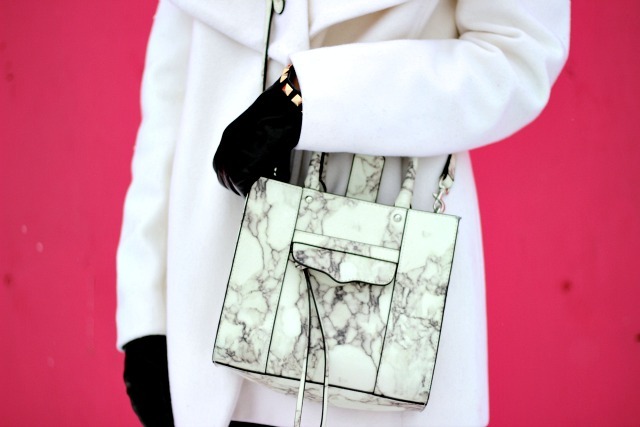 Yes to black and white and an even bigger YES to that marble bag. I love it! Also, seriously killer photoshoot location. A bright pink wall, even if off the beaten path, is like a blogging victory. Such a great spot, especially when you're wearing such a neutral palette.